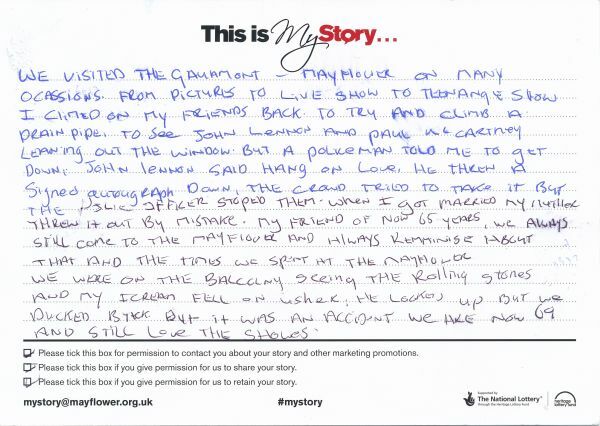 My Story card: Mrs Lydia Munday remembers getting an autograph from John Lennon. We visited The Gaumont - Mayflower on many ocassions from pictures to live shows to teenage shows. I climbed on my friend's back to try and climb a drainpipe to see John Lennon and Paul McCartney leaning out the window. But a policeman told me to get down. John Lennon said "Hang on love". He threw a signed autograph down. The crowd tried to take it but the police officer stopped them. When I got married my mother threw it out by mistake. My friend of now 65 years, we always still come to the Mayflower and always remminise about that and the times we spent at the Mayflower. We were on the balcony seeing The Rolling Stones and my [ice] cream fell on [an] usher. He looked up but we ducked back. But it was an accident. We are now 69 and still love the shows.